Felicity - 1. Happiness, or rather great happiness; blessedness; blissfulness; appropriately, the joys of heaven. 2. Prosperity; blessing; enjoyment of good. Four years ago today, I first saw the signs that let us know our child, 9 weeks conceived, had died. I had to make a fast decision to either go to the midwife who had delivered my three older children and whom I loved and trusted like a best friend, or go to the newly discovered NFP-only OB/Gyn who was just as far to the north of our new house as my midwife was to the south. I chose the doc and have never regretted it for even a second. He was incredibly comforting and treated us and our lost child with an amazing amount of compassion and sympathy. I was surprised by how much it hurt (and still does). I was surprised by how drained I was, physically and emotionally. The flood of hormones that usually ease their way out of your system after the birth of a baby leave in mass exodus when you miscarry. I tried to comfort myself with the thought that women near and dear to me had lost children at 4, 6 even 8 months in the womb and that God had been kind to me to take this child before I had the chance to really know them. That consolation became my heartache later. Who was that child? Was he a fussy little man like his older brother with a probing intellect and enough questions to drive a mommy crazy? Was she a princess/ballerina/bride/veterinarian like her two older sisters who would have cuddled and cooed at her all day long? The pain of a lost child must be tremendous if you have already had the chance to touch and smell that pink bundle of joy or even just felt them kick and squirm inside of you. But many strong women here can attest to the pain and sorrow that is also felt by mothers who have lost these wee tiny ones. I knew my child was there. I knew when I conceived him/her. I knew before the strip turned pink that God had given us a lovely little blessing. And I wanted. that. child. I didn't turn in anger to God, but I sure had lots of sobbing questions for Him. Our dear pastor was the one who pointed out that the day we first saw the signs was the 1800th anniversary of the martyrdom of Sts. Felicity and Perpetua. The name "Felicity" became the name I used when I thought about our little one. I will not know this side of Heaven whether that child was a boy or a girl; a lover of trains and planes or princesses and puppies. But I can know that my little Felicity is blessed and blissful, experiencing the joys of Heaven without ever having to endure this valley of tears. We will have our Coffee, Tea and Thee time today and we will talk about our family's personal little saint. There will be no crafts or books, just... time. Time spent getting to know these beautiful creatures that Our Lord has shared with me. Time spent reminding them of their own littleness which wasn't too long ago. Time spent thinking about the little one we won't know until we (hopefully) enter into the felicity of Heaven. 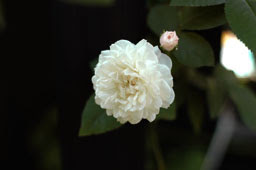 Photo above is a climbing rose called Felicite et Perpetue. Felicity is the perfect name, Matilda. And such a beautiful rose. I'm sorry for your loss. I cannot imagine the sorrow you must still feel. I'm wondering if the NFP-only doc is the one I see? He shares a name with the Golden Arches? If it is--I love him! I go to church with his family, and his wife has miscarried before (just had her 5th baby too) so his heart is near yours in your grief I'm sure. Anyway--what a lovely way to celebrate the short life of your little one as well as the saints of the church. Since my husband was familiar with your "Mean Green" references I know where you live and yes, he is the guy! I just saw him for a check up a few weeks ago and heard about his new little blessing. He is the best! I am very sorry for your loss. I can only imagine the heartache you have felt. 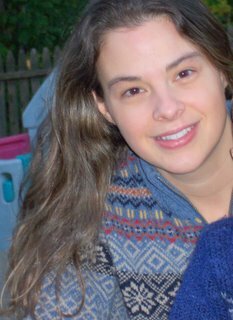 I am new to your blog and have been enjoying Red Cardigan's blog. We are moving to the southern part of Texas in the next year (between Galveston and Corpus Christi) and I think it is neat to know you and Red are in Texas.